Roberto Aguayo’s harrowing, steep spiral out of the NFL continued today, as the living embodiment of an imposter syndrome nightmare was released for the second time this offseason, this time by the Chicago Bears. Aguayo was lousy during training camp with the Bucs before being cut after Tampa’s first preseason game. The Bears took a flier on him, but he blew his first attempt, during Chicago’s second preseason game, and, according to an ESPN report, he’s been struggling throughout training camp. Connor Barth will now reportedly enter the season as Chicago’s kicker. 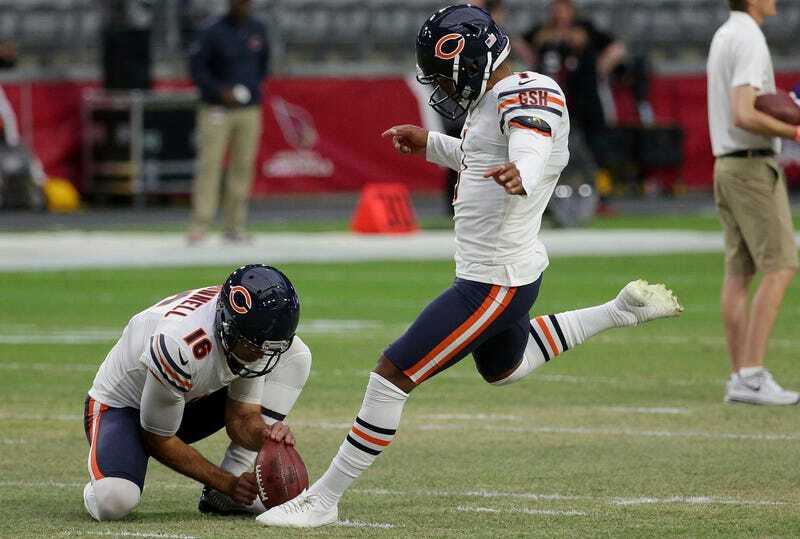 If there’s good news for Aguayo, it’s that his $428,000 contract for this season was apparently guaranteed when the Bears claimed him on waivers, so, just like all the good kickers with jobs in the NFL in 2017, he’ll make pretty good money to not miss a lot of field goals this season.